JLR's Special Vehicle Operations unit currently modifys existing models like the high-performance Range Rover Sport SVR. GENEVA (Bloomberg) -- Jaguar Land Rover's Special Vehicle Operations unit may create its own cars instead of just modifying existing ones to build a following among consumers seeking a high-performance alternative to BMW, Audi or Mercedes-Benz. "We're certainly looking at that, and we've got the capability to do that," said John Edwards, head of the company's performance unit. "Is there an opportunity for us to do a completely stand-alone car? Maybe." JLR, which has been adding new vehicles to broaden its reach in the market, would be following in the footsteps of Daimler's Mercedes if it commissions sporty models from the high-performance division it founded last year. The German company's AMG unit has produced two: the SLS and the new GT, which replaced the gull-wing sports car last year as the top pure-performance model in the Mercedes lineup. Like JLR's SVR project, in which the R stands for "race," Mercedes AMG, BMW Group's M and Audi’s RS units also make performance versions of their brands' regular cars, with more powerful engines, sporty design elements and track-tuned suspensions -- and higher price tags. The strategy makes sense for nameplates with racing pedigrees, said Peter Fuss, a partner at consulting company Ernst & Young's German unit. "It's part of their genes," Fuss said. "The rise in AMG sales shows it's been a good way to attract buyers happy to spend that little bit extra." Mercedes AMG sold 47,500 last year, more than doubling deliveries since 2011. That was about 2.9 percent of Mercedes's total sales of 1.65 million cars, a small but profitable segment. The high-performance AMG version of the Mercedes E-class sedan, for example, comes with a 550hp engine and costs $93,600, 81 percent more than the 195hp base version, while the $222,000, 621hp S65 AMG costs more than double the basic S-class sedan. The M variant of the BMW 3 series has more than double the horsepower and, at $62,000, costs 60 percent more. JLR doesn't disclose deliveries of individual business units. The performance division will probably never contribute more than 10 percent of the carmaker's sales, Edwards said in a March 3 interview. Itself a luxury unit of India's Tata Motors, JLR wants to boost its deliveries this year to more than 500,000 vehicles. Still, it's an opportunity to "stretch the Jaguar Land Rover brand," Edwards said. The high-performance and custom cars division started selling JLR's priciest-ever SUV last month. 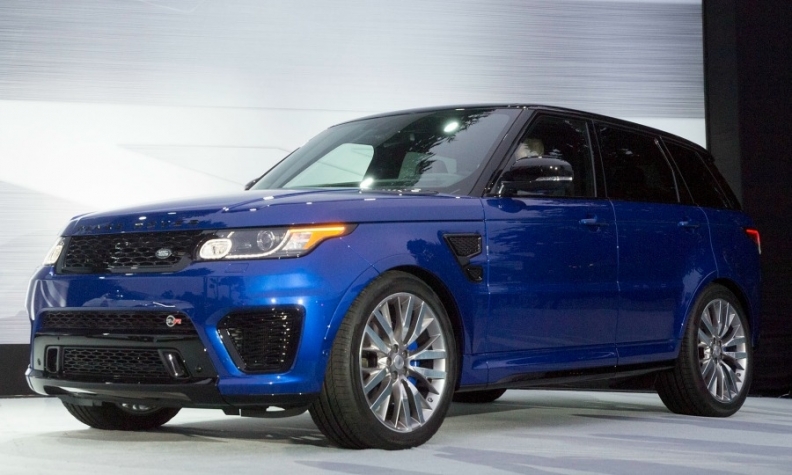 The big, modified Range Rover Sport SVR costs 93,450 pounds ($142,500) and accelerates faster than the two-seat Porsche Boxster or Cayman. JLR also put the new unit in charge of vehicle customization and heritage. Options for putting one's own stamp on a vehicle will be similar to what Ferrari and Rolls-Royce buyers are used to, Edwards said. Customization "is a huge area for our Range Rover customers," he said. Customers often spend an extra 25,000 pounds for one-of-a-kind features like matching the color to a handbag or another car, embroidering a crest on the interior or customizing the wood on the doors or dashboard. The division is also building the Project 7 variant of the Jaguar F-Type. Capped at 250 vehicles, it will have the quickest acceleration of any Jaguar. And this month, it finished the first of six hand-built versions of the classic Lightweight E- Type. Even at more than 1 million pounds apiece, they've already sold out.